The Hoover Dam (originally known as the Boulder Dam), which holds back the mighty Colorado River forming Lake Mead, is located on the Arizona-Nevada border on Highway 93. It's 30 miles southeast of Las Vegas. It's a popular tourist destination whose Bureau of Reclamation tour alone draws nearly 1 million visitors every year. The bureau has been leading visitors through the dam and power plant since the '30s. It is no less impressive today. If you want to visit the Hoover Dam, the first place to start is at the visitor center. Here, you can make your reservations, get the opening hours, learn about special events, and more. Look for the warning signs before you cross the Hoover Dam. Not all types of vehicles are allowed to cross the dam. Even better, do a little research on the important information before you leave. You might be surprised to know that RVs and rental trucks can cross the dam (but they may be inspected). It's tempting to want to stop and take photos of the Hoover Dam or just pause and take it all in. Look for the many pullouts to safely do this. Don't stop on the street. The visitors center is on the Nevada side of the dam and it can be a bit more crowded but is another place to park. If you want covered parking or primo parking spots, be prepared to pay. Oversized vehicles, those with trailers and recreational vehicles can't park in the garage closest to the visitors center, though. They have to park in a lot on the Arizona side of the dam. If you're on a budget, you can find lots on the Arizona side a bit further up the canyon that offers free parking, if you don't mind the walk across. There is a closer lot on the Arizona side that costs a fee. The visitor center is open at 9 am. and closes at 5 pm. The Hoover Dam Visitor Center is open every day of the year except for Thanksgiving and Christmas. You can head out on the Dam tour which is available on a first come, first served basis for those over 8 years of age. (Younger children cannot go on the tour.) For those wanting to see the Power Plant, too, you can reserve a ticket online or at the visitors center. All ages are allowed on the Power Plant tour. Neither tour is accessible for those in wheelchairs or with limited mobility. Yes, you can enjoy the Dam for free. Park in one of the free parking areas and walk across the dam. There are plenty of great photo opportunities and interesting information posted along the way. Look up as you walk and see another marvel of engineering: the construction of an immense bridge across the river just downstream from Hoover Dam. This is on the Hoover Dam Bypass. The construction of the Hoover Dam originally named the Boulder Dam, backed up the Colorado River, resulting in the formation of Lake Mead. The dam was completed in five years. The contractors were allowed seven years from April 20, 1931, but concrete placement in the dam was completed May 29, 1935, and all features were completed by March 1, 1936. Nearby Boulder City was built in 1931 to house the dam workers. It is the only city in Nevada where gambling is illegal. Visitors can enjoy antique shopping and restaurants. There are restrooms in the visitors center, parking garage, adjacent to the Old Exhibit Building and in the downstream face towers on top of the dam. There is a food concession at the dam. Shopping for a souvenir? You'll find some interesting things at the gift shop on the lower floor of the parking garage. 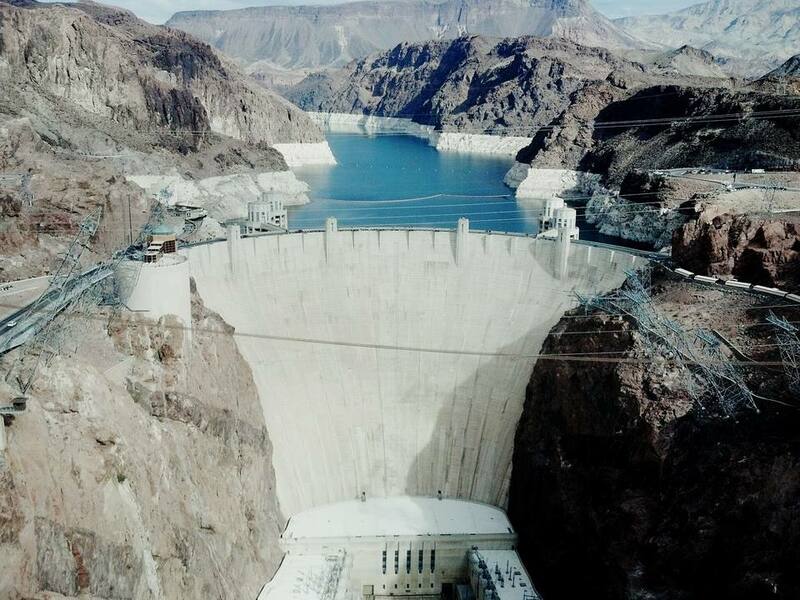 The Hoover Dam is a major attraction. It is worth visiting, but you may want to avoid the crowds. The slowest months for visitation are January and February. The least crowded time of day for tours is from 9 am. until 10:30 am. and 3 pm. until 4:45 pm. Remember that you are in the desert. It can get hot at Hoover Dam (lots of concrete, remember?). Dress accordingly and bring water. When you are at the Hoover Dam, be sure and take the time to look at the Hoover Dam Bypass. The bridge over the Colorado River is viewable from the dam and as you drive across. The immense bridge is both amazing and scary. It is 900 feet above the river, making it the world's highest concrete arch bridge and the second-highest bridge in the United States, behind the Royal Gorge Bridge in Colorado. The main part of the bypass, which rerouted the highway to have fewer sharp turns, is named the Mike O'Callaghan–Pat Tillman Memorial Bridge. The bypass opened in 2010.